Aware of the challenges faced by young graduates looking for work after university, Jordan Moore has enlisted the help of his role models to try to inspire others. 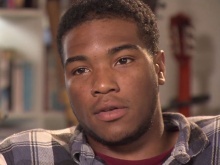 His story was shown on ITV News London on Thursday 2nd October between 6:00 and 6:30pm. The 21-year-old Fixer from Romford wants to support his peers in their search for work, by encouraging them to do something extra to make themselves more employable. ‘I’m doing a media and communications degree and I’m in my final year,’ explains Jordan. ‘I’m worried about getting into such a competitive industry – I feel daunted. ‘People think that as soon as they leave university, they’re going to walk straight into a job. I’ve seen my friends struggle and understand that it’s not going to be that easy. With Fixers, Jordan is helping to create a booklet, including success stories, tips and advice from people who have thrived in the media industry. In the broadcast he shows a draft of the booklet to actor and filmmaker Femi Oyeniran. ‘It’s really good. 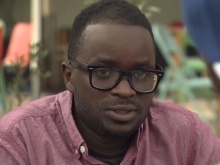 It will be helpful for young people who need to know that it’s not a fairy tale,’ says Femi. ‘When I was 17, I went to an open audition for a film, which turned out to be Kidulthood. ‘After finishing university, I decided to go into acting full-time but I didn’t get any roles. 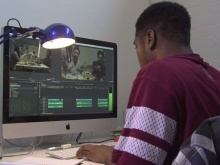 Jordan, who’s undertaking work experience with a digital video production company to boost his future job prospects, adds: ‘I’m realising that you can’t be shy in this industry. ‘You have to speak out, put yourself out there and be the one that everyone wants to see. ‘Through my Fixers project, I’ve met a lot of positive role models. Lots of people have encouraged me and helped me along my path, even though I’m just beginning. people to stand them in good stead for the future. Watch his TV story.